Underground water tanks, which have also been called cisterns, are used for the underground storage of water. These storage tanks are excellent for rainwater storage, wastewater, potable water, irrigation systems or other applications. Many people would rather have an underground water tank than one that is readily visible above ground. There are several advantages to going underground, with aesthetics and minimal microbial growth being the main advantages. Whatever the need may be, underground water tanks can be a great option. Polyethylene tanks are a great alternative to bulky concrete tanks. Once installed, polyethylene tanks have an expected life of fifty-plus years and never need service.What are referred to as concrete water tanks are usually septic tanks being used for water storage. Concrete tanks are not certified for potable water and frequently need “relining” – a time-consuming and expensive service. Life expectancy of concrete tanks is very hard to estimate since it depends on the quality of the tank manufacturing process which varies greatly from day-to-day, even in the same factory. 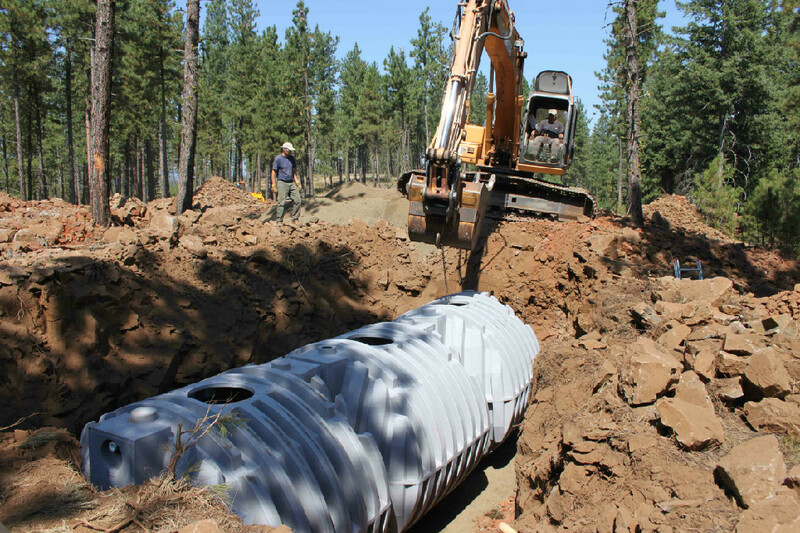 Installation of our OcTanks is very simple – a properly-sized hole is excavated, the bottom is “bedded” in gravel, the tank is assembled, and the hole is backfilled. Pea gravel, or a similarly-sized material is used for fill around the tank. OcTanks may be installed and run dry. Underground storage tanks can be accessed via a manway. Manways are installed on any OcTank module which has equipment installed in it, or might otherwise need some future access. When the OcTank system is installed under a traffic slab or other structure a Manhole is poured into the concrete to allow access to the manway. Depending on need and usage, multiple modules can be assembled into a larger capacity tank with our patented “interconnects”. Every OcTank system is completely pre-manufactured in our plant and shipped directly to the jobsite in “kit” form for turnkey installation. •Underground water tanks are installed below ground level and are often used to store rainwater or other applications. •The tank is placed in the ground and the hole is backfilled with pea gravel. •Equipment in the underground water tank can be accessed for maintenance through a manway. Underground water systems can be a great option for today’s home or business owner. They also work well for campsites, resorts and vacation homes. FreeWater Systems is your complete provider of rain capture systems in North America. We provide polyethylene storage systems and all of the accessories necessary to complete your rain capture system. FreeWater Systems can help you achieve the optimal solution for your rain capture storage. Contact us today for design information and pricing.